Laura Rothrock started Varsity for 4 years in High school, competing at state both her junior and senior years. She finished her senior year with 215 strikeouts. She made all-conference and set multiple regional records throughout her high school career. After high school she then went on to play Division 1 college softball at IPFW. 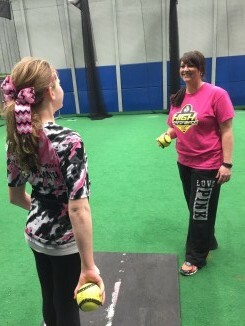 Laura currently coaches travel softball and gives pitching lessons. As a former college pitcher who struggled with arm problems and a mom of a young pitcher who started hitting her side with her elbow and having a permanent bruise on her side I decided it was time to find someone who could help! Upon research and finding Tincher Pitching and Fluid Dynamics I decided to give it a try. After the first lesson with Jonathan my daughter didn’t hit her side anymore. As I sat through more and more of her lessons I became more intrigued and curious and realized that this allows the female body to use everything that makes them powerful and strong, create and transfer energy as well as prevent injury. I knew at that point that I wanted to learn and be able to teach my students all of the great things I was giving my daughter the opportunity to have, to pitch relaxed, smooth, effortless, and pain free and at the same time gain speed and more movement with every pitch! My first weekend of studying with Denny was exciting and I couldn’t wait to get back to share everything with all my girls and implement the new things I had learned. Tichner pitching and Fluid Dynamics has brought a new level of excitement for me with lessons that I couldn’t have imagined possible. Denny’s excitement and enthusiasm for helping each girl and her individual needs is contagious and I wish I had him in my life 15 years ago to help me! Here is what Denny says about Laura. The impressive thing about Laura is that she was not satisfied with conventional methods. For her daughter, and for all of her students, she wanted to be positive that she was doing the best possible job so she did some searching. We are so happy that she included us in the search. Laura brings the perfect background: former college pitcher, mom, pitching instructor, and best of all she is bright, curious, and always looking for the best way to help each student. As our first Certified Instructor in Indiana, she is representing us well.